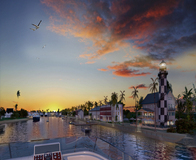 At over 100 acres and accommodating 640 vessels, the Port St George marina will be the most spacious in The Bahamas. The large expanse of water will assist in making the harbour-style marina as storm safe as possible, as well as providing large yachts with room to manoeuver and the surrounding homes with spectacular views. 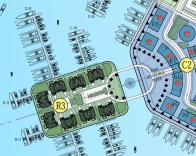 With the marina village and the yacht club at its centre and the five-star hotel prominent on the western dockside, the Port St George marina will be the centrepiece of the development. 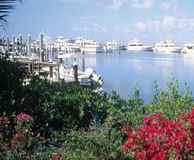 All of the homes in the marina area have been positioned such that they are at most a few hundred yards from the waterfront, so that strolling to and from the extensive facilities will be easy and pleasurable. Port St George will be more than a resort, it will be a welcoming community and the village centre will be a bustling and cosmopolitan place that will provide owners, crew, visitors and islanders alike with a superb place to shop, bank, meet and dine. 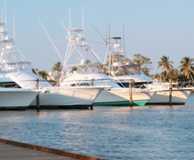 With Port of Entry status, fuelling and chandlery facilities, the Port St George marina is designed to be a home port for vessels as well as an excellent place for passing yachts to visit.